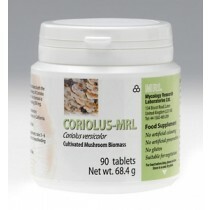 The coriolus mushroom is an Asian fungus which has been used by healers and practitioners of folk medicine for a long time. Researchers in recent years have studied the chemical components of the mushroom to identify substances that might have pharmaceutical effects, and have isolated two such substances. Polysaccharide peptide (PSP) and polysaccharide krestin (PSK) are both found naturally in coriolus mushrooms, and may have pharmaceutical effects in boosting the body’s immune system. These substances are also believed to fight the growth of cancerous tumors, making extracts from this mushroom a possible treatment (though not a cure) for patients with cancer. Coriolus is the scientific name of this Asian mushroom, which is commonly known as “turkey tail mushroom,” and known in China, by the name Yun Zhi (which translates to mean “cloud mushroom”). Chinese healers have used this mushroom for centuries, treating a wide range of conditions including herpes, hepatitis, chronic fatigue, pulmonary disorders, impetigo, ringworm, urinary tract infections, digestive tract infections, liver disorders, and more.Its use are documented as early as the fourteenth century (at which the time the practice of its use had likely already been established for centuries). Japanese researchers began examining the extract in the 1970s, and sales of coriolus, turkey tail, products now top one billion dollars annually in Japan alone. As is the case with many forms of “folk medicine” around the world, the use of coriolus to treat cancer has come under study and scrutiny by modern scientists. The PSP and PSK substances are extracted from deep tissue layers of the mushroom, and research results show that the polysaccharides extracted from coriolus bind to specific proteins on tumorous growths, impeding the growth of the cancer. The results of this research, particularly by researchers based at the New York Sloan-Kettering Cancer Center, have been published in refereed science journals, proving the efficacy of coriolus in fighting both cancer and the cancer-causing human papilloma virus. Researchers have additionally begun to grow a strain of coriolus mushroom which contains higher concentrations of the pharmaceutically useful polysaccharides, which can also be more easily absorbed into the digestive system after being consumed by a human. The coriolus extract also serves to boost immunity, making it useful in the treatment of other conditions as well as cancer. Studies published in the Cancer Immunology and Immunotherapy journal show that the use of coriolus enhances the number of white blood cells in patients, as well as boosting the function of those white blood cells in attacking and killing toxins and pathogens. Because of its effects on the immune system, scientists are researching the use of coriolus in treating other diseases. Potential diseases for which this might be a useful treatment include the group of illnesses categorized as “autoimmune” and inflammatory disease, which includes conditions like rheumatoid arthritis and Crohn’s Disease. While researchers are exploring the science behind the effects of coriolus extract, the extract itself continues to be used--as it has for centuries--by healers and lay people alike. Sold as a supplement, it is not regulated by the FDA in the USA and no prescription is needed for its use here in the UK. Many people use it as a preventive measure, insuring against infection as well as cancer, and boosting immunity, respiratory health, and the body’s basic organ systems.The extract itself is inexpensive and easy to obtain, and has no recorded side effects. Scientists back its use, and individual consumers are taking that recommendation around the world.